Recently remodeled and in the heart of downtown Glasgow, Montana, Rundle Suites Hotel offers its visitors clean, quiet, and comfortable living quarters to kick your feet up and catch the rest you deserve. Whether you’re a hunter, just passing through, or planning on an extended stay, we guarantee that you will feel at home in our luxurious rooms. Yet, one of the most enticing parts of staying with us is breathing in the lush American history that our quaint town has to offer. We have just recently celebrated the centenary of the Rundle Building, so a stroll through our hallways can give you a glimpse into the building’s history, but look out the window and you’ll almost hear the centuries old echoes from the past. Glasgow gives the unique opportunity for any history buff to learn rich stories of days gone by. Let’s travel back and highlight some of the most interesting historical narratives that made our town, and our hotel, what it is today. For centuries, the Assiniboine people and members of the Sioux Nation called Valley County home. The land was heavily populated with massive herds of buffalo and pronghorn antelope giving the tribes bountiful sources for food and living materials. Roaming through the valley today, there is still a chance you’ll uncover fossilized remains of these tribes’ teepee rings, assorted artifacts, as well as views of “buffalo jumps,” cliff formations used by the Native American people to hunt and kill large hordes of bison. The early 19th century brought major change for these nomadic tribes, and by 1887 a treaty was signed surrendering nearly 18-million acres of land to the US government. This led to the creation of the Fort Peck Indian Reservation which, to this day, holds annual events celebrating the people’s beautiful cultural heritage including pow wows, dancing, and arts and crafts. The first excursionists through the region were an expedition led by two men you may have heard of, Lewis and Clark. They set up camp about 15 miles away from what is now Glasgow. When viewing the unique, white hue of the water they bequeathed it “Milk River,” the name we still use for the tributary of the Missouri River. The years after this brought more visitors and in the late 19th century the Great Northern Railroad made its way west. Initially referenced as Siding 45, because it was the 45th rail siding west of Minot, our town reportedly got its name when a blindfolded railroad clerk placed his finger on a spinning globe. Those near hovered around in anticipation as the rotations slowed to a halt, his finger resting above the city of Glasgow, Scotland. Apparently this was common in the railroad industry for other railway towns in Montana have names such as Malta and Zurich. After this, Glasgow was known as a quaint agricultural community until the construction of the Fort Peck Dam. Glasgow saw a significant boom of population and business starting in the 1930’s when President Franklin D. Roosevelt authorized the building of the Fort Peck Dam. The dam was to be used for flood control, and eventually hydroelectric power, but it also brought thousands of men seeking work into the valley during the hard economic times of the depression. Along with their families, it is estimated that up to 50,000 people made this move during the peak of construction. Obviously, this was a primary source of employment for the area, and helped make the town what it is today. During the construction of the Rundle Building in 1915, Spanish Mission Revival architecture was a very popular style for architects due to the Panama-California Exposition. This includes the distinctive terracotta tiles and parapet walls still visible today. Originally designed for the Rundle Title and Abstract Company owned by local celebrity Sidney Rundle, the building attracted homesteaders from all around due to its modern structure and features for the time. One of the Rundle Building’s claim to fame was that the stores on the first floor would be illuminated by electricity so that people could shop… even at night! Obviously this is common for us now, in fact, we’d just assume the shops were closed if no lights were on, but in the early 20th century it was a marvel. The building also featured the first elevator in the city, and the basement included a bowling alley, billiards, a barbershop, and… wait for it… two showers! During the 1960’s the top floor of the hotel was converted into apartments until 2013 when it was remodeled into the beautiful hotel we now proudly call Rundle Suites. We invite you come enjoy our historic hotel, as well as our town with roots going back for centuries. Located in a neighborhood featuring great shops (with lights), a fresh deli, and a 24-hour lounge and eatery conveniently located across the street, we promise to give you the most enjoyable stay possible. By the way, we have more than two showers now! 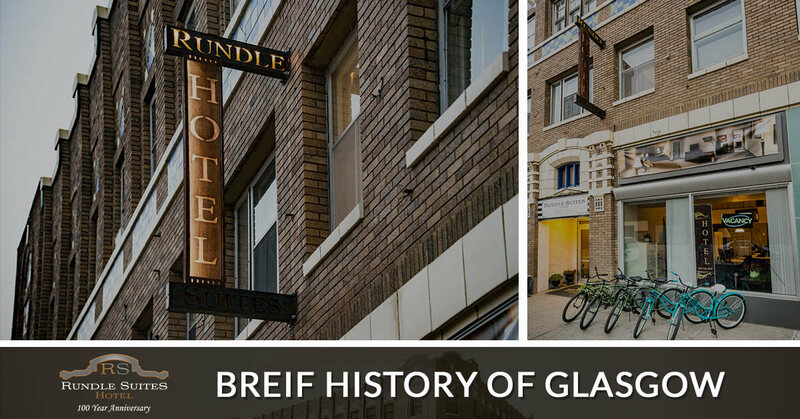 If you’re a hunter, visitor, or history buff, we are dedicated to your satisfaction and ensure you’ll love your stay at Rundle Suites in downtown Glasgow, Montana. Browse through our website for more information and book your room now and if you’d like to learn more about Glasgow history while you’re here, be sure to check out the Valley County Pioneer Museum.